Round 1: Lopez pushes Lontchi back with a combination. Lontchi circles as Lopez presses forward throwing a right jab and right hook. Lontchi lands a left hook to the body. Lopez fires a straight left followed by a right hook to Lontchi's head. Lontchi walked into a right hook. Lopez placed a good right hook to the body. Round 2: Lopez is aggressively coming forward landing straight lefts and right hooks. A straight left - right hook combo drops Lontchi in the corner. Lopez lands a counter right hook to the head. Round 3: Lopez continues to press forward landing a series of straight lefts and right hooks. Round 4: Lopez gets Lontchi in the corner and bangs away with a right hook to the body. Lontchi fires a straight right to Lopez's head. With Lopez attacking, Lontchi lands a counter left hook to the body while against the ropes. Lopez continues to fire and land his punches in volume; just landed a right jab - straight left. Round 5: Lopez hits Lontchi with a right hook to the body. Lontchi lands a good straight right to Lopez's head. Lontchi nails Lopez with a straight right again to the head. Lopez hits Lontchi in the head with his right jab. Round 6: Lopez presses forward throwing combinations off his right jab. He landed some solid right hooks to Lontchi's body toward the end of the round. Round 7: Lopez is firing a series of left uppercuts. Lontchi is trying to fight Lopez off with his back against the ropes. Lopez is ripping hard shots to Lontchi's body with his right hook and throwing straight lefts. Round 8: Lopez has really worn down Lontchi with his assault. Lopez is trying to stop him. Round 9: Lopez lands a right hook to Lontchi's head. Lopez swarms Lontchi with punches. Lontchi fires a straight right to Lopez's body. Lopez knocks Lontchi down with a straight left to the head. Lontchi gets tagged with a right hook. Lopez is trying to finish him; lands a right hook to the body. Lontchi quits on stool! Overall Summary: Juan Manuel Lopez is the complete fighter at 122 lbs. After the fight, he said he may have just one more fight at 122 lbs. before moving up to take on tougher opponents. Tonight, he systematically broke down a previously undefeated Olivier Lontchi with effective aggressiveness and landing a large volume of punches. The 25 year old southpaw from Puerto Rico took the fight to Lontchi from the opening bell and forced him to quit on his stool after round 9. 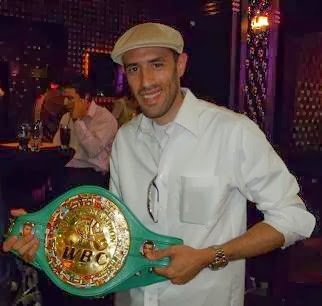 Lontchi never got into any kind of groove and was constantly being chased around the ring by Lopez. Lopez threw his combinations off his stiff right jab. As the fight got into the later rounds, the body punching of Lopez had a huge effect on Lontchi's performance. Lopez found openings and placed his punches well especially with Lontchi on the ropes. Lontchi's best round came in the 5th when he landed a few good straight rights to Lopez's head, but Lopez took the shots well and continued to be the aggressor. Lopez has very good balance and threw better combinations as the fight went into the later rounds. Juan Manuel Lopez improves his record to 26-0, 24 KO's. His last 14 wins have come by knockout. Olivier Lontchi's record drops to 18-1-2, 8 KO's.